I remember the first time I tried sausage with syrup. It was at my cousins’ cousins’ house. Yes, you heard that right; and yes, it was in Kentucky. We were all enjoying a delectable pancake breakfast, probably after another memorable sleepover involving video games, NKOTB, and possibly a makeover, but more likely just too much sugar. As a side note, I had always been fairly meticulous with my plate as a child; every food should be kept in its own separate place, never mixing with anything else, and God Forbid anything get stacked on anything else (unless it was red beans on rice, or some similarly exempt food). So there I was, enjoying my pancakes, a sausage link carefully pushed to one side, so as not to intrude. But then – oh then! – I saw it. In my youthful zeal, I had overdone it with the Mrs. Butterworth’s (as you will at that age), causing a veritable syrupalanche that coated the whole plate to the rim. The sausage never really had a chance. I was also rather shy as a child, hardly daring even to ask things of close relatives for fear of seeming impolite. So rather than do the unthinkable – admit that I had spoiled a prized piece of sausage, and beg for another pristine one – I steeled myself, and took a tentative bite, determined to choke it down as best I could. And lo and behold, my eyes were opened, I saw the truth, and I saw that it was good. Syrup and sausage are incredibly awesome together! I think I poured on still more syrup for the remaining piece of sausage. In my more recent, more sophisticated-palate years, I have developed a great fondness for a bit of good cured-meat charcuterie. Salami, prosciutto, Spanish chorizo, soppressata, boudin, breasola, you name it, I’ll eat it happily. So when I came across a recipe for Sausage Pancakes, I thought it would be a perfect addition to this week’s recipes. But to my surprise, the sausage referred to was a raw sausage, rather than my favored and assumed cured sausage. Of course I modified it, substituting a spicy cured pork sausage instead, but keeping the otherwise-typical pancake base. Just make sure to get a good-quality sausage; what’s the point otherwise? 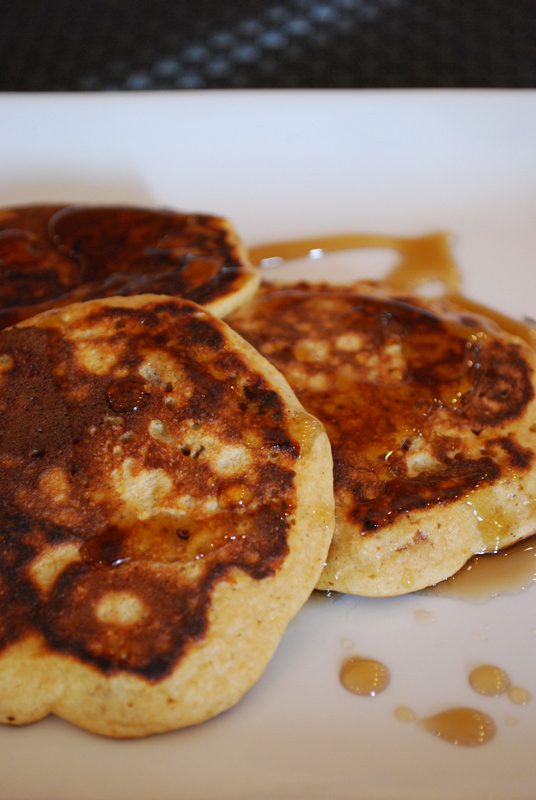 There is no added sugar in the batter, all the ingredients are certainly savory in nature; but somehow, the familiar pancake format leaves these begging for at least a drizzle of syrup, if not a bath of the stuff. And if you’ve never tried syrup with sausage, just wait until you try these. Forget stabbing together a bite of pancake with a bite of sausage; here, it’s all built in. Convenient! Heck, these would even make a good (if slightly indulgent) to-go breakfast; freeze a batch, pop one in the toaster while you’re getting dressed, and eat it while you’re running out the door. Of course, they’re absolutely perfect for a lazy Sunday brunch, too. Add a little fruit salad on the side, top off with a Mimosa or two, and you can call it a day! 1. Heat oil in a large nonstick skillet over medium heat. Add onion and cook until soft, about 5 minutes, stirring frequently. Add sausage to pan and cook until some fat renders out, stirring frequently, about 4 to 5 minutes. Remove sausage mixture to a plate lined with paper towels, to drain some fat off. Set aside. 2. Whisk together the flour, baking powder, baking soda, and salt in a large bowl. Combine buttermilk, applesauce, and eggs, and add to the flour mixture, stirring just until smooth. Add in the sausage mixture. Preheat oven to 200º F.
3. Heat nonstick pan or griddle over medium heat until hot but not smoking. Using about 1/4 cup batter per pancake, pour or spoon batter onto the hot surface. Turn pancakes when the tops are covered with bubbles and the edges look cooked. Remove pancakes to a sheet pan in the oven to keep warm until serving. 1. You can add some herbs or spices to these if you like. Thyme is always good with sausage of any sort, but may want to customize the flavoring to the type of meat you use. A pinch of cinnamon or clove would be excellent with pork sausage, or with a chicken-apple sausage. Try a hint of rosemary with turkey sausage; or match cumin to the fennel in Italian sausage for a sweet-smoky note. I recommend using only a pinch or two, to keep the sausage as the star of the show. 2. I used a cured pork sausage (similar to chorizo), which is ready-to-eat out of the package; but you can use any type of sausage you like. Just make sure to cook it thoroughly if you use a raw one!